If Not A Sparrow Falls Without God Knowing, How He MUST Care For Us! Recently I came home to find my canary very ill and I knew that he didn’t have long to live. He has been with me for over 15 years. That is a long time for a canary. And over the last few months, he has been getting weaker and less able to move around, so it wasn’t totally unexpected. As I took him from the cage and held his shaking body, trying to give him some comfort in his last minutes, I felt so helpless, unable to do anything to ease the pain he was in, simply praying that it wouldn’t last too long. Thankfully, it didn’t. I will miss his company, but this week as I thought about it, I believe his life, and his death, showed me some important lessons. When he was young and carefree, he had a real joy of living and his days were filled with song and activity, alert to all that went on around him. I can see a similarity in that to my life before I was injured. As he aged and got weaker in this last year, he was not so able to get around in his cage and the times when he had that carefree joy, were less frequent and he seemed to give up some things. As my life has also been since illness has limited my abilities. When I held his dying body in my hands, I was reminded that the Bible says that not a sparrow falls, without God knowing it – and I’m sure that includes canaries too. But just as God cares about the tiny birds, He also numbers the hairs on our heads and says we are worth more than many sparrows. For those of us with chronic illness, we are often troubled by our worth in the sight of other people, but our worth in God’s sight, no matter how limited we are physically, or mentally, is never in question. Fiona Burrows lives in Melbourne, Australia. She is thankful for the difference God makes in her life as she lives with chronic pain. She enjoys finding time for reading, writing, travel and photography. You can contact her in the Sunroom. Our contribution may be limited in this life by age and physical problems, but we can always give encouragement to others who are more able and are still young. Encouragement is a wonderful thing to bestow upon others. We recently buried our dog of 15 years; my sister and I grew up along with her. It was sudden and unexpected, and the months since have been trying. When we sat in the hospital room with her, I knew that God was watching over all of us. It is comforting to know that as life gets more complicated and frustrating because of my physical health, I can know that he didn’t leave us then and won’t leave us in the future. I too held a dying canary in my hand, at 8.00am on a weekday morning, when I was just about to depart for work and take children to school. However, I felt I just couldn’t part with him while he was shutting down. 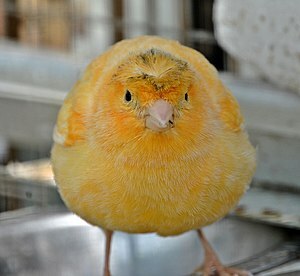 Ari, the canary, had been such a joy and so full of song earlier in our family life. It was so sad to see him pass and I felt I couldn’t part with him too early. in a small cage…they need to fly and should be in a big aviary if you have them as pets. It would be like us being in a prison cell if they were locked away. KUDOS to Erika!!! I completely agree with you!!! I have a pet Quaker parrot – totally spoiled. He has a big cage and he is NEVER in his cage when I am home. He loves his cage, which is his home within a home. He freely goes on his own into his cage when I leave the house. He does this because he doesn’t see his cage as a trap, like birds do when they are trapped 24/7 inside their cage. Keeping birds in cages 24/7 is criminal. A large aviary, with companions, is humane. They are highly intelligent, social creatures, NOT decorations. Thank you, Fiona, for posting this article. It was very sad, made me cry, but I was pleased that you comforted your canary in his last moments. My doctor has been telling me that I have needed heart surgery for two years and I kept putting it off as my wife has COPD and I have been taking care of her. I have been short of breath for a couple months and one day when I was putting out grains of rice for the sparrows and other birds that eat it by our patio I noticed one little sparrow that did not fly away when I was near it and it just hopped away a couple of feet. About thirty minutes later I went outside to see if it was still there and it looked like it was taking very short breaths and I said a little prayer for it and it suddenly died. I buried it by a hedge and while doing that I thought about the verse in the bible of how GOD sees a sparrow when it falls and I realized that what I had seen was a sign for me to listen to my doctor. I called the next day and made an appointment with him and while we were planning the operation I told him about the sparrow. I cannot express the look in his eyes and that of his nurse. GOD tells us things that we don’t always listen to, but I got the message and I thank him for what he has done. I owe it all to GOD and the little sparrow. About 5,000 children a day die painfully from water born diseases because of the lack of clean water. And we still think God provides for even a little sparrow? There is a real world out there folks. it’s that God is with both the sparrow and with us as suffering overtakes us. And knowing that God takes notice of the small creatures in this world should give us encouragement that He’s with us in our sufferings as well. The message for all creatures great & small is: WE ARE NOT ALONE!! That’s the real world. This is beautiful, Fiona. Thank you for sharing. I wrote about some little sparrows (dark-eyed juncos) that recently resided in our yard. [http://ramonamckean.com/goodbye-little-birds/] Especially given what happened, the story of your canary and the reference to scripture are timely for me to come across. So thank you again. Caging a bird is the most evil, unnatural thing you can do to a bird. Today a loved baby bird died. He was a free garden bird, a pied Butcher-bird, and his extended family brings joy to my family. Somehow he sustained an injury and his parents stopped feeding him. He flew back and forth from the tree to the kitchen window sill and we fed him as best we could, When his kin began attacking him, we managed to capture him and take him to FAWNA, the wildlife rescue people, who took him in. We all thought he would survive to be freed again but he must have had other serious but less visible injuries and he died. He was not very old and we did not know him very long but that time was his lifetime. Nature is as ruthless as it is wonderful. i hope God saw ‘ this sparrow fall’. Fiona, that is truly a beautiful message, thanks a tonne for penning & sharing with us. Seeing the Sparrows worthless value of a cent and yet God takes notice? God, takes notice of each one that falls to the ground, you’re not worthless, but valuable and God takes noitce.